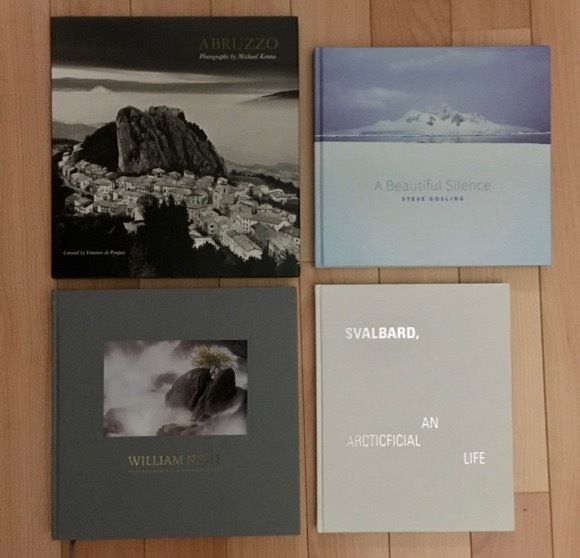 I acquired four new photobooks over the Christmas period - 2 gifts and 2 gifted to myself. I’ve decided to bunch quick reviews of all four together here, because otherwise I’ll never cover all four. A Beautiful Silence is a collection of photographs taken over 3 weeks by Steve Gosling as part of the staff on a photographic cruise to the South Atlantic and Antarctic Peninsula. It reads much like a visual travel diary, but rises several notches above the average vacation shot collection. More than several, in fact: A Beautiful Silence goes beneath the skin of both the location and the photographer, and presents a deeply personal vision of an area that perhaps we’ve become photographically too accustomed to. The other-worldly beauty and fascination of the environment certainly comes across, but so too does the personal impact on the photographer. The sense of separation from the familiar tangibly comes across in the selection of the photographs, and the interpretation goes way beyond the superficial. Steve Gosling also has developed a clear personal style, whether in monochrome or colour, favouring strong contrast and uncluttered compositions. I get a feeling that he tends more and more towards a preference for monochrome, and to my tastes his style works better there. In colour he prefers a certain kind of high saturation which although quite different from the usual “all sliders at 11”, burn-your-eyeballs-out style favoured by more populist photographers, it isn’t always to my taste. Nevertheless this doesn’t detract from the overall atmosphere, and anyway, my tastes are not exactly a benchmark. Technical note: The production of A Beautiful Silence was assisted by Olympus, who get a big credit, and all the photography was made using Olympus cameras. Normally I wouldn’t mention this, but since I use Olympus gear as well it is interesting to be able to compare results. In my polar photography I have seen a tendency for Olympus cameras to produce very harsh noise in the deep, saturated blues found in many iceberg shots. I see hints of the same issue in Steve’s shots. My solution has been to be very, very careful with sharpening and noise reduction in these areas. Still, the overall quality of the finished product does bear clear testimony to the fact that Olympus Micro four Thirds cameras are as significantly beyond sufficiency as any other type these days. I’m going to risk being burned as a heretic here, but I’ll say up front, I have not been able to engage with this book. This hefty tome presents a retrospective of work by US photographer William Neill over the last 4 decades. It is beautifully printed and presented, like all of TripleKite’s publications, and I even got my name in the credits as I pre-ordered. There is no doubt that William Neill’s photography is technically flawless. Everything is fantastically controlled, from concept, through execution, to post-production. But the overall impression I get is that this is in fact really his objective: to achieve the perfect photograph. And the problem is, the actual subjects of the photographs seem to be interchangeable and of secondary importance at best. All of the classic themes of “Fine Art” landscape photography are present and correct, autumnal forests, misty waterfalls, misty forests, macro flora, misty macro flora. There is even a short Antarctic section, drawn from a 5-day trip. Only towards the end does something a little unusual crop up, in a set of semi-abstract, intentional camera movement shots. And everything is flawlessly executed. The full photographic content of the book is actually viewable online. Perhaps it is the nature of a retrospective, but I don’t get any clear sense of what William Neill is really trying to achieve. Although, and I emphasise, the photography is exceptional, he appears to mainly travel around to find locations that will best allow him to demonstrate his commendable skills. That’s all well and good, and even ideal for a commercial photography, but it doesn’t inspire me much. Ten or fifteen years ago, I’d have thought differently, but my photographic horizons and education have expanded, and these days I’m looking for something beyond superficial beauty. I think classic landscape photographers will love this book, though, and they are obviously the target audience. This is made quite clear by the appendix, which carefully lists all of the technical details of the photos. I’m really not sure why photography books, other than educational manuals, do this - really, does it matter that the photography used a Canikony Rocketflash XYZ1000 Mark 36 Turbo with go-faster stripes? Not to me it doesn’t, in fact I find it vaguely degrading. True, the same can be said for Steve Gosling’s book, but that is offset by the fact that it was sponsored by Olympus, who will want their pound of flesh. I’m not sure what the reason is here. The driving force behind “Svalbard, An Arcticficial Life” is one I can strongly identify with: the desire to capture the strangeness, but also the comfort, of a living space artificially layered over a fundamentally hostile place. Svalbard cannot of itself support human life, or at least not in the form of a modern Western culture. I suppose it could have supported Inuit communities had they ever reached its isolated shores. Nevertheless, there are three thriving outposts, Longyearbyen, Barentsburg and Ny Alesund, and a handful of abandoned settlements (Pyramiden, Ny London). The photography in this book is drawn from inside and around Longyearbyen and Barentsburg. The incongruous shot of a stretch limo against an Arctic background has already appeared in a number of reviews of this book in international and specialist press, but it is only one of many that could be selected as a highlight. The collection of landscapes, wide and intimate, of portraits, and of interior and exterior scenes of everyday life in Svalbard all combine to perfectly depict the atmosphere of this strange place. The photography itself is crystalline, befitting the subject. This is a book to immerse yourself in. It really strikes a chord with me, which might be a personal thing, but there is some really strong story-telling going on here. The production quality of the book is excellent. The publisher, Kehrer Verlag, Berlin, has a very interesting and prolific catalog - I have a couple of other books published by them, “Steinholt” by Christopher Taylor, and “Restricted Areas” by Danila Tkachenko, and I’m sure these won’t be the last. There is no technical information on the photography at all (which is fine with me), but based on the general feel and the rather formal poses in the portrait shots, I have a hunch that it could be shot on large format film. You can order “Svalbard, An Arcticficial Life” direct from Kehrer Verlag or from Beyond Words. Last but very far from least, Abruzzo by Michael Kenna. There isn’t really much I can add to any conversation about Kenna. There are very, very few photographers who have carved such a distinct, instantly recognisable style. Many have tried to copy it, but a square format, black & white and long exposures are just the ingredients, and the way in which they are blended together is pretty much unique. Michael Kenna’s style is so fully established that it becomes almost transparent - as far as form is concerned, you know exactly what to expect, and all attention is available for the content. There is a strong element of a direct connection in his photography which I’ve rarely seen - the equipment, the mechanics of making photographs, the burden of making choices, all of which get in the way somehow, here are just invisible. We know exactly what the constraints are going to be, so we can fully absorbed by the image. The element of direct connection is very present in Abruzzo. Immediately you feel that the photography has a strong emotional connection with the place, and wants to find out what makes it tick. Studies of otherwise banal scenes like beach umbrellas convey identity and character. There is one shot taken from a low perspective on a mountain road which just reeks of warm asphalt and pine trees. Actually, because of this character in Kenna’s photography, I’m quite selective in buying his books. For example, personally I’ve never been especially interested in Japan, therefore his Japanese work doesn’t really attract me. Probably that doesn’t make a lot of sense. But in any case “Abruzzo” absolutely envelopes me, and I’m sure it is a book I will revisit time and again. You can order “Abruzzo” from Nazraeli Press. Beyond Words also stock the last 3 of these books. Beyond Words is a bricks & mortar and online shop dedicated to photobooks, and very much deserves our support! POSTSCRIPT - between the time I started writing this and finishing, Triplekite Publishing sadly announced they were ceasing all publication and selling off stock. This is pretty bad news - they haven’t provided any details at all, but I can only assume that financial reasons were a big part of this. Unfortunately these days the photography is all about gear and instant, fleeting validation. People complain about books costing $75 but quite happily pay $200 for a camera strap. These days, as they say, everybody is a photographer. But hardly anybody is interested in photography.